What is LucidWorks Site Search? 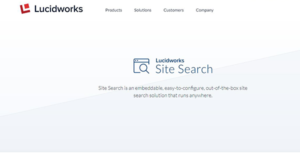 LucidWorks Site Search is an enterprise-grade and OS agnostic website search software that can be deployed in the cloud, on-premise, or on a hybrid architecture. It’s an AI-powered solution that drawls site content to deliver search results that are fresh, relevant, and complete. The platform allows users to narrow searches with impressive faceting and rich filters for faster site search exactly where and when you want it. The LucidWorks Site Search is an easy-to-configure and easy-to-use solution that comes with smart panels for drag and drop control over user data experience. It’s an embeddable platform that provides out-of-the-box tools to expedite and streamline site search for organizations of different sizes. Some of its main features include AI-powered personalization, flexible user interface, and quick configuration. LucidWorks Site Search is a powerful site search solution that brings everything in one place. It’s a fully functional site search application where once you configure the data and interface you can conduct a site search in minutes. The platform is available on cloud-based, on-premises, or hybrid deployments which give you the freedom to choose a model that fits your operational and security requirements. The built-in smart panels boost your search IQ and give you drag and drop control over data user experience. The panels coupled with the flexible UI complement Site Search architecture and put content delivery in the front and center for every search. This makes it easy for your site visitors to find what they are looking for quickly. Every page, every document is the perfect mantra that compliments LucidWorks Site Search performance. The application crawls all your business content, looks at user behavior and weblogs to deliver search results that are complete, fresh, and relevant. It leverages the innovative AI-powered personalization of Fusion Artificial Intelligence that uses user behavior and query to fine tune the relevancy of data for the best results. Better still, Site Search is powered by the latest release of Fusion platform which supports seamless integration with Spark to boost search with machine learning. It utilizes small robot built to understand your user and customize content presented to each user. If you are interested in LucidWorks Site Search it may also be a good idea to investigate other subcategories of Best Site Search Solutions gathered in our base of B2B software reviews. It is essential to realize that virtually no service in the Site Search Solutions category is going to be an ideal solution that can fulfill all the goals of all business types, sizes and industries. It may be a good idea to read a few LucidWorks Site Search reviews first as specific services can dominate exclusively in a very narrow group of applications or be designed with a really specific type of industry in mind. Others may operate with an intention of being simple and intuitive and consequently lack complicated functions desired by more experienced users. You can also come across apps that focus on a wide group of customers and provide a rich feature set, but that usually comes at a higher price of such a software. Make sure you're aware of your requirements so that you buy a software that has all the functionalities you look for. How Much Does LucidWorks Site Search Cost? Contact the vendor and get their detailed enterprise pricing and other product information. We realize that when you make a decision to buy Site Search Solutions it’s important not only to see how experts evaluate it in their reviews, but also to find out if the real people and companies that buy it are actually satisfied with the product. That’s why we’ve created our behavior-based Customer Satisfaction Algorithm™ that gathers customer reviews, comments and LucidWorks Site Search reviews across a wide range of social media sites. The data is then presented in an easy to digest form showing how many people had positive and negative experience with LucidWorks Site Search. With that information at hand you should be equipped to make an informed buying decision that you won’t regret. What are LucidWorks Site Search pricing details? What integrations are available for LucidWorks Site Search? If you need more information about LucidWorks Site Search or you simply have a question let us know what you need and we’ll forward your request directly to the vendor.